SWiCH is a scientific breakthough that enhances mitochondrial function and restores skin to its youthful appearance. Looking at the current means of rebuilding or restoring skin to a more functional and youthful appearance, we are overwhelmed with the fact that all these agents are based on injuring the epidermis, causing massive exfoliation. By injuring the skin the natural repair mechanism is initiated and new tissue is generated to effect the repair. This process is not innocuous, however, for serious side effects can occur. Essentially all the other agents used depend on Protein denaturation. This process creates a greater demand on the energy production, in a system that is already overtaxed. You should therefore stop inducting further epidermal damage and instead rebuild the dermis. 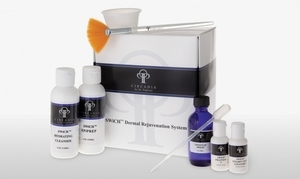 SWiCH will induce repair with minimal damage to the epidermis. Switch from destructive repair to physiological repair. Switch from peel to the perfect solution-turn on the fountain of youth by switching to SWiCH. Hydrating Cleaner: A special preparation wash to remove impurities. Cellular Swich: Contains Krebs cycle intermediaries to stimulate fibroblast and collagen production. An amazing cell growth activator. How does it work: Krebs cycles acids, citric and pyruvic acid, stimulate the mitochondira within the fibroblast, leading to enhanced collagen production in the dermis. A cell growth stimulator. Is it safe: SWiCH is metabolically compatible with human physiology thereby minimizing downtime due to epidermal damage. Safe and easy to use. Frequent treatment will dramatically improve the condition of the skin. What can you expect:: Skin will look and feel younger, firmer, more evenly toned. A more luminous, healthier, clearer, more refined skin will be noticeable after only one application. Repeated applications will chase the years away. How often can you have it done? Repeat application should be spaced a minimum of two weeks apart for six to ten treatment. Follow this with three monthly treatments and then once per quarter or as desired.